Lincoln exhibited seven classic vehicles on Wednesday, all of which were over 51 years old. 1929 Lincoln L Dietrich Convertible Coupe: One of just 75 ever produced, this Lincoln touts an L-head V8 engine, which produces 90-horsepower. Looks wise, this stylish vehicle features the iconic leaping greyhound mascot radiator cover, which was made by the renowned silversmith Gorham. 1932 Lincoln KB LeBaron Convertible Roadster: Originally priced at $4,600, this famed KB model features a V12 engine and 150-horsepower. Unfortunately for the KB, it debuted during the height of the Great Depression, which led Lincoln to discontinue the pricey vehicle after just two years. 1937 Lincoln Derham Sport Sedan: Based on the Model K platform, this classic vehicle touts a 150-horsepower V12 engine and unique styling including teardrop headlights, pontoon fenders, and a fastback roof. This particular Derham Sport Sedan underwent 9,000 hours of restorative work, which was rewarded with a first-in-class win at the 2004 Pebble Beach Concours d’Elegance. 1937 Lincoln-Zephyr Coupe-Sedan: Manufactured from 1936 to 1940, the Zephyr was a lower priced luxury car designed to bridge the large price gap between the Ford V-8 DeLuxe and the Lincoln K-series. Named after the Burlington Zephyr streamlined train, this vehicle has a V12 engine, distinct split grille, and comprehensive bodylines. Although nearly 86,000 Zephyr models were built, only 5 percent were Coupe-Sedans. 1940 Lincoln Continental Cabriolet: Originally intended as a one-off personal vehicle for Edsel Ford, the Lincoln Continental was introduced in 1939. Specifically, the Cabriolet model was an elegant convertible with long fenders, short trunk, mounted tire and Lincoln’s signature V12 engine. The vehicle displayed on Wednesday was once owned by George Gehrig, cousin of baseball great Lou Gehrig. 1956 Continental Mark II: Regarded as one of the classic automobiles of the postwar period, the Mark II was a personal luxury vehicle produced by Lincoln’s Continental Division in 1956 and 1957. This specific model was built for actress Elizabeth Taylor, even boasting a striking violet exterior designed to match the star’s distinctive eye color. Other famous Mark II owners included Elvis Presley, Frank Sinatra, and Dwight Eisenhower. 1961 Lincoln Continental Sedan: Primarily known for its front-opening rear “suicide doors,” the completely redesigned 1961 Continental was the first postwar four-door convertible and first car manufactured in the U.S. to be sold with a 2-year bumper-to-bumper warranty. 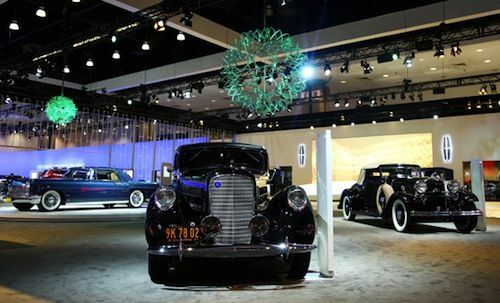 The L.A. Auto Show vehicle is celebrated as a Lincoln Continental Owners Club Senior Car. Despite taking a “What’s Old Is New Again” approach on Wednesday, the automaker will show of its all new MKZ sedan and MKZ Hybrid on Thursday. I think you either like Lincoln's design or not but this is the first time Lincoln puts those old inspirations next to their modern cars. And you know what? It works. It makes you appreciate this styling they insist of the brand. At least, it's well displayed there and makes you understand what they're shooting for.